The Flir InfraCAM SD thermal imaging camera is available on hire from Wavecom Instruments . The product has been developed for electrical and mechanical inspection work. This thermal imaging camera can save up to 1000 images onto a single SD card in jpeg format for full post analysis. Reporting capabilities are possible with easy to use QuickReport software. This ultra-compact, light in weight InfraCAM SD is capable of discovering electrical problems within minutes of getting it out of the transit case. 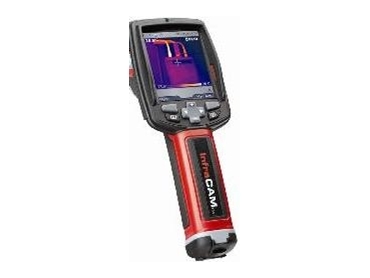 Whether trying to find loose connections, overheating fuses, motors with bearing problems or any other electrical problem in commercial premises or production facilities, this thermal imaging camera will enable the user to clearly see the areas of concern on the bright colour LCD display. This Flir InfraCAM SD thermal imaging camera can be used for both inside and external applications. The utilisation of this thermal camera can help in the detection of poor electrical connections which can lead to overheating and fire. While using the InfraCAM SD, the user will see problem areas well in advance and avoid breakdowns, shutdowns and or fires. The Flir InfraCAM SD thermal imager is available for hire from Wavecom Rentals and it can be employed for many other applications such as monitoring of individual products, dies, insulation and steam traps. The temperature range covered is -10 to 350 degree centigrade.